Garden Tour: Join Us For a Demonstration Food Forest Tour and Talk! Interested in learning how to turn your home into a sustainable, bountiful oasis? Curious about water, climate and practical solutions you can apply in your own backyard? 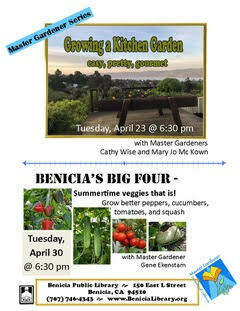 Join us Saturday, April 27, for talks and tours of 10 demonstration food forest gardens in Benicia and Vallejo. These private back and front yards are open once a year for a self-guided tour. Each garden is a unique experience: some are compact front yards, others are on a slope, some share space with animals and small children, some are allowed to grow without restriction, while others are more manicured. They all are lush, food–producing gardens that are fed by secondary water sources (laundry-to-landscape greywater and rainwater). The food forest keepers (homeowners) will be available to share their experience and to answer questions about their custom gardens. The demonstration food forest gardens will be open 9 am-2 pm. Stop by Avant Garden between 9-11 am to pick up the list of gardens to tour. You can also sign up that morning to join Lydia on a guided tour of one of the demonstration food forests. 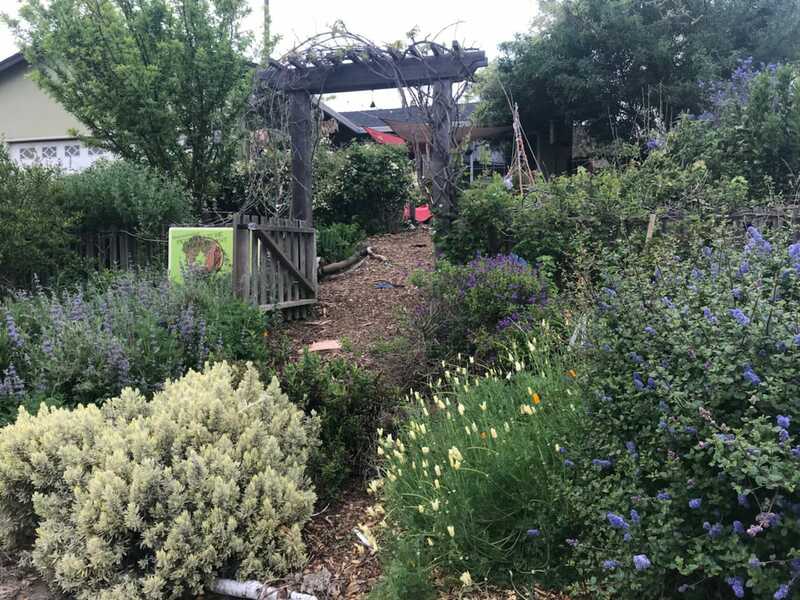 At 2:30 pm, Dog Island Farm in Vallejo will host a guided tour of their working urban farm and the new Grow a Pear Nursery. Vallejo-grown plants will be available for purchase that day at both Loma Vista Farm and Dog Island Farm to add to or begin your own food forest garden! This program is made possible by the generous support from the Solano County Water Agency. Check Out the Gardens Before the Tour! One thing nature teaches us with each season is that change is an inevitable part of the cycle of growth. 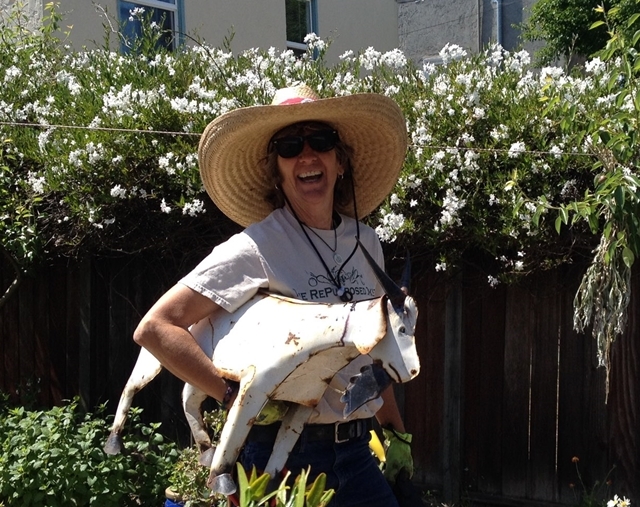 At Sustainable Solano, we have been lucky to have Kathleen Huffman, owner of The RePurposed Okie, as a central force in our sustainable landscaping work. Kathleen and the program have grown together and she has played a key role as our lead landscape designer. Now, as Kathleen plans to move back to Oklahoma this summer to take care of family, we are seeking someone who understands permaculture and uses its principles in food forest garden design to step into that role. Kathleen started her journey with Sustainable Solano when she attended the Land Caretaker Training in 2015. From there she took a Permaculture Design Certificate course and transformed her landscape career from mow and blow to a sustainable landscape business that is now thriving. She became our lead designer for the Solano Sustainable Backyard program and designed 12 demonstration food forest gardens in Vallejo, Fairfield, Suisun City and Vacaville. She has taught sustainable landscape classes throughout the county and guided the installations with the community through teaching educational workshops. We have been so honored to have her with us for four years. For Kathleen, the move back to Oklahoma creates an opportunity to re-open her 10-acre family farm to showcase sustainability and permaculture and bring all that she has learned from her time in California. As we plan for her departure this summer, we are entering a transition phase of searching for the right person to step into the role Kathleen has filled. As we’ve often learned, such transitions can open up new opportunities at the right time for someone who will be a natural fit with the aspirations of Sustainable Solano for the programs we offer to transform our communities. We are looking for someone local who can take on the lead landscape designer role and all that it entails. We need someone comfortable with teaching the community about sustainable landscapes who will be able to guide community members through installation workshops. The ideal candidate would have a PDC, business license and liability insurance and would be knowledgeable about greywater systems and irrigation. 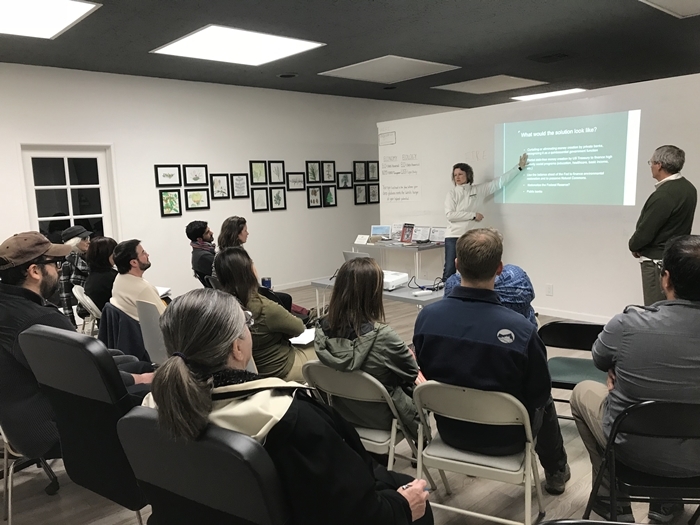 We are looking for someone who not only has an interest in sustainable landscaping, but also has an interest in growing their practice with us while continuing to learn and share that knowledge with the community. Interested in Sustainable Landscaping and Community-Building? Tell Us! Have you ever wondered how Sustainable Solano makes the connections that lead to our involvement in the community? Whether it is the planning and planting of a sustainable garden, the installation of a greywater system, urban forests to bring food and shade to residents or bringing local communities together around these sustainability efforts, the process to find sites can be a long one. Now, you can help! We know that the best way to find the perfect site for a future project is through the people we meet. That’s why we’ve created a quick and easy form for Solano County residents to let us know how they want to get involved and help us identify where programs and projects are needed. We want to hear your vision and look for opportunities that Sustainable Solano can support. We’ll use this information to identify which of our current programs best fit your interests, and it will give us insight as we expand our programs and help to shape future initiatives. 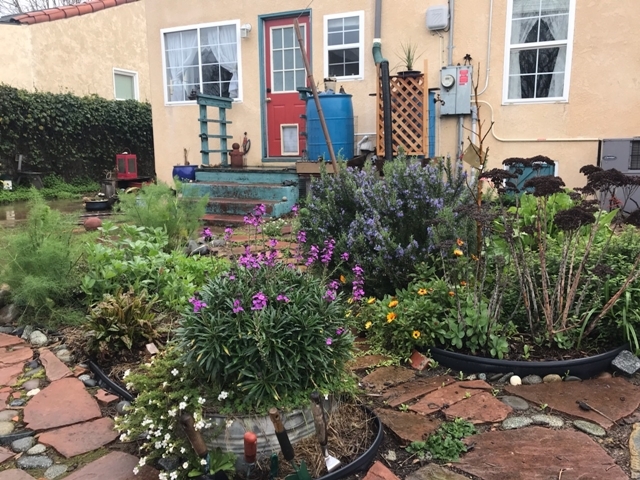 We are seeking both private residents and public sites to be part of our green infrastructure programs that take a restorative approach to our environment and include Sustainable Backyards, Solano Gardens and Urban Forests. We’re also actively starting our search for the first Resilient Neighborhood site in Vallejo. Our vision for the Resilient Neighborhoods program is to unite neighbors to work collaboratively, with the support of the greater community, to install low-cost, low-tech sustainability elements that restore valuable services back to our built environment, like producing food, filtering air and cycling water. Let us know if you are interested in exploring this opportunity in your neighborhood — or let us know what other programs fit your interests. Filling out the interest form is the first step. Become part of the conversation on sustainability and building community. We hope you’ll take a moment to fill out the form yourself and share it with neighbors and friends. Or fill out our interactive online form here. The economy can be difficult to understand, yet we all can identify the many problems that we are facing as individuals and as a society in our current system. 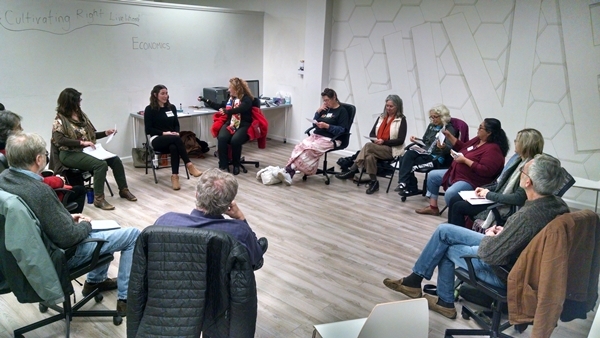 Sustainable Solano has committed to attend the Systems Change & the Next Economy workshop series presented by Santa Cruz Permaculture and report back on what was learned through a series of presentations and community circles at Green Hive Spaces in Vallejo. This gives us an opportunity to explore solutions on how to create a world that benefits the whole within our Solano County community. Economist Della Duncan presented the first workshop we attended in Santa Cruz, titled Cultivating Right Livelihood: Embark on the path of inner and outer transitions for a more beautiful and sustainable world. It was a weekend of questioning the goals of our current broken economic system and soul-searching to find our place in the solution. Each section that she taught began with a tingsha meditation bell and a mindfulness practice; feet on the ground, elongated spine and paying attention to breath. She created a safe space to be vulnerable and explore our inner world and provided opportunities for us to share our insights with each other. Where do you find deep gladness? Which hunger in the world deeply breaks your heart? Many of the problems facing our communities today are daunting and can leave us feeling overwhelmed. The workshop focused on self-reflection and helping to make sense of the current world inside our own hearts and minds. Rather than suggest solutions to the world’s economic problems, Della invited us to consider alternative ways of thinking about the economic system and its shortcomings and focused on ways that we can take action in our own lives. These actions may not change the world overnight, but they give us hope in the face of the unknown and allow us to take comfort in participating in shaping the future, which is all that can be asked of any one person. Sharing an abbreviated version of our learnings, and opening up about our personal experience at the workshop with our community here in Solano County was insightful. The complexity of our planet’s current economic, political, cultural and environmental condition is an emotional subject. Creating a safe place for our neighbors to come together and share their personal experiences — hopes, fears, aspirations — is an important part of the journey forward. It was inspiring to see members of the community come out to be part of the discussion and share their interest in finding solutions. Few of us realize the extent to which the design of the money system, the economic system and the financial system constrains our choices and frustrates our desire to bring forth a more healthy and compassionate world. The purpose of this talk will be to provide an accessible understanding of money, the economy and investing. Community members turned out Saturday, Feb. 23, for an installation workshop at Mangia!, one of our demonstration food forests in Vacaville. The installation focused on the front yard of this property, which already has a backyard orchard with vertical gardening and a sedgefield meadow. Volunteers learned about water-efficient front yard design, dug swales to divert roof water and planted fruit tree guilds to transform the front yard. The demonstration food forest is part of our Solano Sustainable Backyard program, funded by the Solano County Water Agency. Check out the video below from workshop participant David Avery!